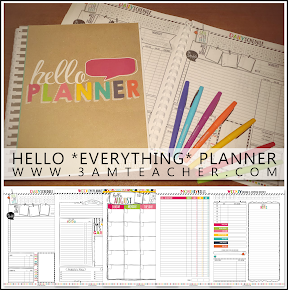 The 3am Teacher: My Favorite Things, A Teacherpreneur Tip & the Art of Sitting, 13 Custom Blog Design Spots Left & A Gift for You!!! My Favorite Things, A Teacherpreneur Tip & the Art of Sitting, 13 Custom Blog Design Spots Left & A Gift for You!!! I get many questions from people wanting to know what types of programs I use and what electronics I prefer, so today, I am going to show you one of my absolute favorite buys from Amazon. The MAC version includes several really cute colors, while the PC version only includes an all black or a mostly black with a white trim. 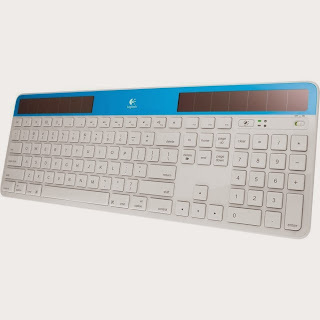 I was sorely disappointed that Logitech did not offer the colored versions for PC, but I continue to keep checking. As soon as they do, I would LOVE to have the white one with the bright blue strip... very cute!!! Here is a little video so you can see the keyboard I use...I have had it for about one year and I absolutely LOVE it!! It is very quiet and the keys are perfectly raised, which is nice for my wrists and fingers. I needed a thin keyboard that could fit on my desk while I was drawing with my Cintiq. My Cintiq is 24 inches and weighs close to 100lbs. Since it takes up most of the space on my desk in the vicinity that I am working in, I needed a light, thin keyboard that I could easily move or tuck away when I positioned my screen over my lap to draw. It was closer to $80.00 when I first purchased it, but now you can get it for around $60 and even less if you have Amazon Prime (which I do)!! If you are worried about it charging, have no fears!! 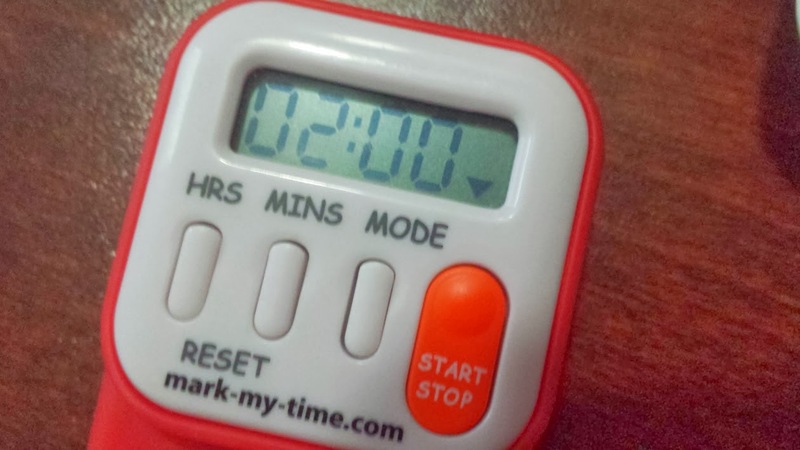 I ACCIDENTALLY stumbled upon a cool solution. The keyboard stays charged for a VERY long time (about 3 months); however, if I go a few days without sunlight, the power will reduce. 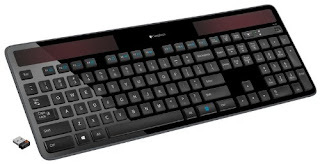 If it gets under about 70% charged, the keyboard will begin to act funky and the typing speed will have a delay, which is super annoying (to say the least). Hello, my name is Michelle and I am a Post-It Whore!! 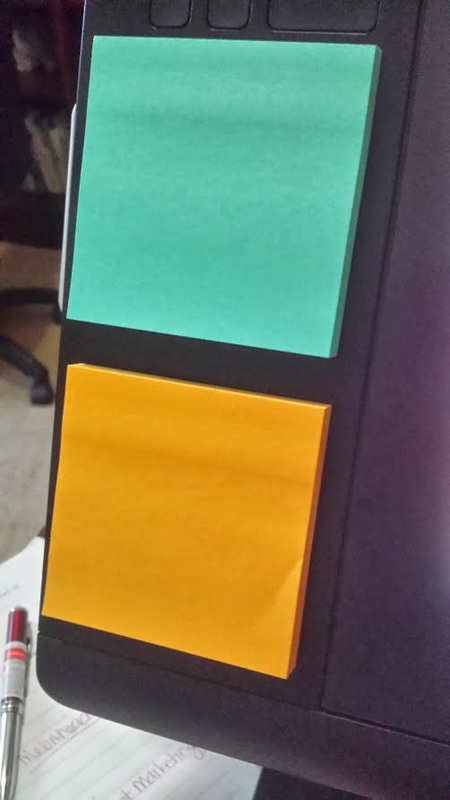 Yes, a Post-It Whore!! My $3,000 Cintiq is now the home of my obsession and I keep a stack stuck to the empty space of the outside of the screen to write down ideas, remember things, or just to doodle while I am talking on the phone. 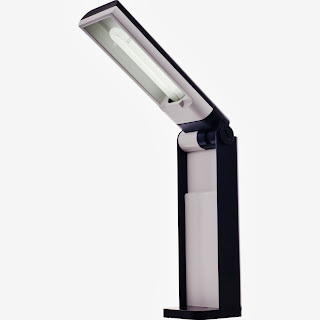 I believe that Wacom should build me a Cintiq that has built-in areas for Post-its and a small side drawer to keep my pen nibs in.... but they would have to give me the new model for free, because I could not afford another one... lol!! P.S. They should have also included a built-in video cam!!! How did they NOT think of that?? I despise having to rest my video cam on the top ledge of my Cintiq, because I always seem to forget that it's there. Whenever I move my screen, the darn thing falls off.... This would have not been a problem if my desk fit the duel screens, but I can't stand clutter and having another screen just makes me feel too boxed up. However, I LOVE my colorful Post-its!!! Something New... Despite my work load, I have made it a personal goal to add, at least, one new product a week to TpT (and my other online shops). I noticed that my sales were significantly dropping and decided to make some minor adjustments to my weekly goals and priorities. 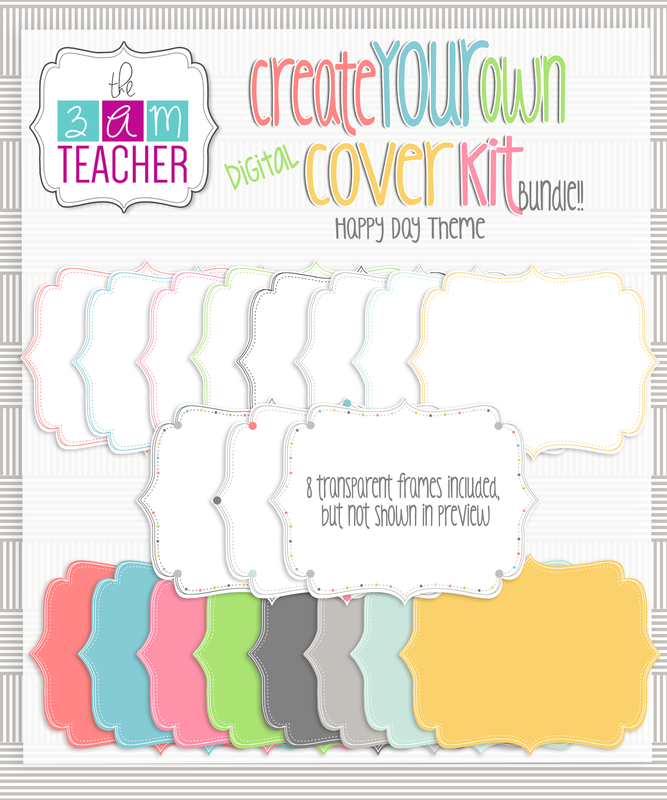 I mean, this is how I support my family, so any drops in sales is a drop in our only source of income at this time.... Now you might understand the urgency to adjust my weekly goals.. haha Here is my newest Teacherpreneur set: Meet my Happy Themed Create Your Own Digital Cover Set... This one is really packed with goodies and perfect for Spring!! 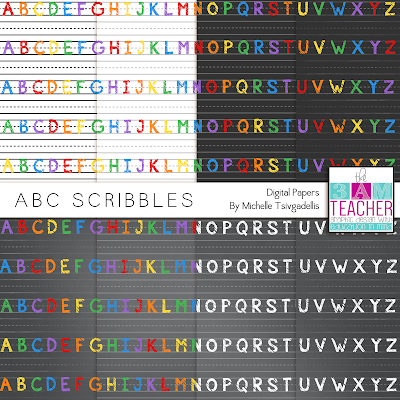 The Digital Papers can also be purchased separately, but I am not sure why anyone would want to do that.. LOL!! 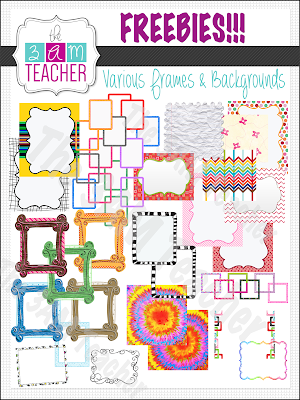 Grab this set at my Teachers Pay Teachers shop Grab this set at my Etsy Shop I also recently updated my FREE Frames and Borders Set on Teachers Pay Teachers!! It was time!! Despite having over 150,000 downloads to date, there are only a little over 500 ratings. I would love to dramatically increase that number and would appreciate your feedback if you have this freebie or plan to download it. I will continue to add more frames to the file each month until it hits the maximum file size for TpT. Exciting News!!! Last week, I let everyone know that I will only be taking 24 custom blog design orders this year and wanted to fill up the spots before the end of the month. So far, I have booked 11 Custom Blog Design and I still have 13 available spots. The custom blog design must be paid in advance, but this is to ensure that I can account for the schedule for the year and plan financially as well. I would love to have the remaining spots filled before the end of the month and I am not full up until the middle of March. Some booked spots for December 2014 and May 2014, so the months of March through December are pretty open at this point. My orders continue to come in and I have about 6 people who are waiting for their TpT payout to make the business investment in their blog design. I promise... you will not be disappointed you ordered early!! If you would like to get your spot booked, please complete the form using the link below. Please know that the form is quite intensive with questions, but please only complete the areas that you can. If you are unsure what colors, fonts, or patterns you like.. don't worry.... leave it blank, because you are paying me to be creative for you!! I enjoy doing this and hope to work with more of you!! You DO NOT need to have a blog to order a custom blog design. If you want to order the custom blog design and have me help you set up a Blogger blog, leave that for me to do as well. It will not cost you extra. A Gift for You!!! 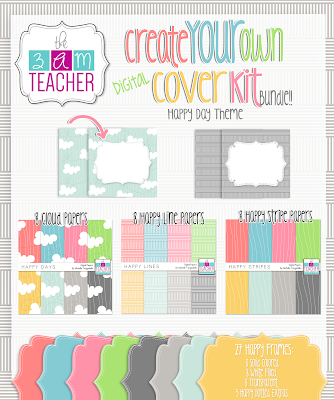 Grab these digital papers at my Teachers Pay Teachers shop by clicking on the image below! 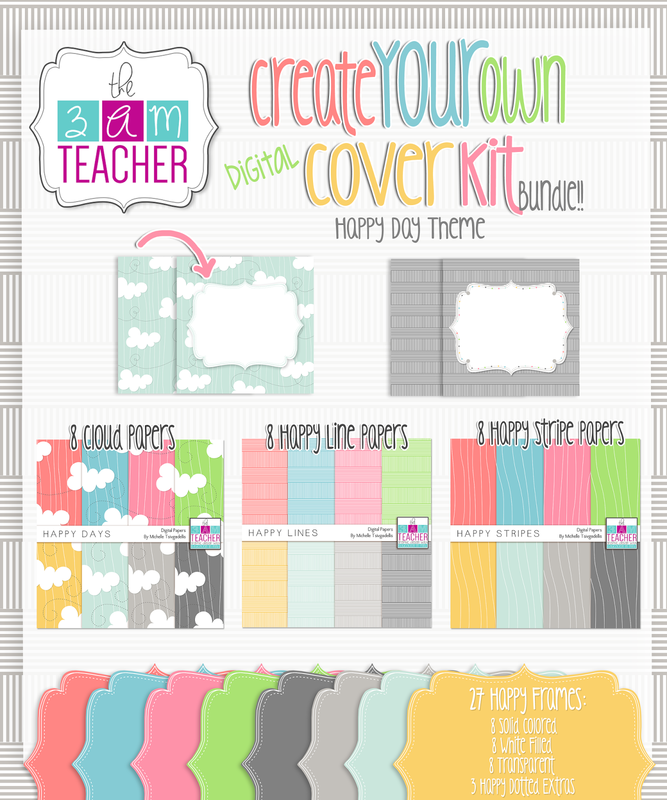 Enjoy & please make sure to leave me some sugar once you download them from TpT... FREE only on TpT!!! I love this post Michelle! Thank you for the freebie. The papers are so cute!! You are very welcome!! Thank you so much for stopping by!! LOVE the new papers, they are so irresistible. Hmmm, feel the need to shop! Keep those creative juices flowing, you are an inspiration!